Visibility and control of endpoint devices are critical to securely manage your workloads in the Amazon Web Services (AWS) environment. Ideally, teams want to gain real-time visibility and control without having to deploy an additional agent onto the Amazon Elastic Compute Cloud (Amazon EC2) instance. They want a tool that allows them to span physical, virtual and cloud environments of their existing on-premises endpoints and Amazon EC2 instances. 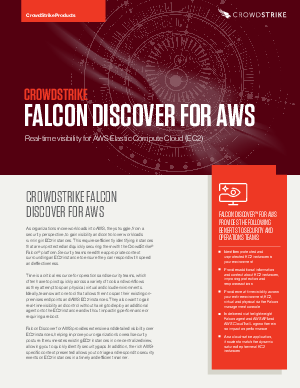 CrowdStrike® Falcon Discover™ platform allows you to identify unauthorized systems and applications in real time and quickly remediate issues, ensuring the integrity of your data.